My experience with ZTD : Week #1 results | Laurent Maumet. This is the feedback after 1 week. For this first week, I’ve decided to implement 1 new habit : 3 MITs. The habit is simple : at the beginning of the week, and then every morning, I’ll list the 3 MITs (Most Important Topics) that I want to achieve during the day (or the week). Total : I’ve defined the MITs everyday, I’ve achieved 11/21. 11/21 is a poor result. I’ve clearly over committed to myself during that week. There’s 1 specific MIT that I’ve pushed from day 1 to day 5 (finally I did it in day5) that made me loose 4 points. Defining the 3 MITs at the beginning of the week and every morning really helped me to focus on the good topics and to realize when I missed them. During this first week, I’ve also drastically simplified the way I use my todo system (nirvanahq). I’ve removed all project, and used 1 simple list. I’ve also simplified the actions (remove duplicate actions, remove actions I’ll never do…). As a result, I feel really more comfortable with this system. ps : why did I put a bonsai here ? 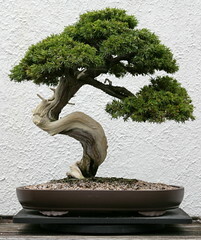 Because I like bonsai’s !